Six Flags discounts often begin at home. 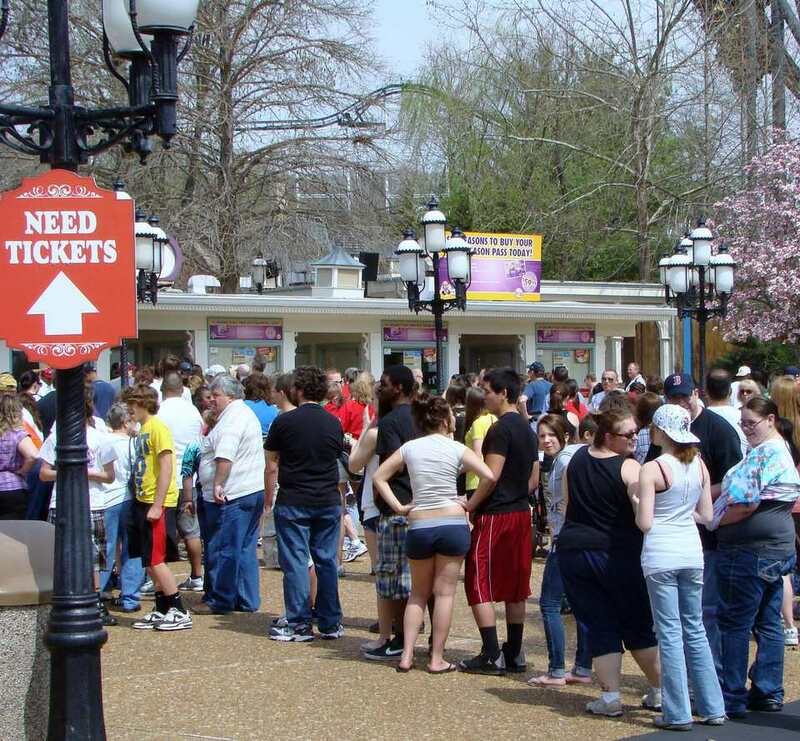 This is what the early afternoon line looked like on opening day just outside of Six Flags St. Louis. Why wait in this long line just to get into the park? Here's a better idea: buy admission tickets online at a discount, print them yourself and present them at the turnstiles. There are plenty of lines in which to stand once you enter the park. The most popular rides can cost you 60 minutes at peak times. Even purchasing lunch can involve a long, hot line. Do yourself this favor and take care of the admissions before you leave home. If for some reason you purchase online but misplace your ticket, follow this procedure: present the credit card used to purchase the tickets, a photo ID and your email receipt or order confirmation number. You know that food and souvenirs are not included in the admission fee. You also know that it's advantageous to find a Six Flags hotel that's reasonably priced and close to the park. But many of us fail to budget for other items that cost extra inside the main gate. Do you want to buy the park photographers' pictures? Will your children want you to fork out cash for the bungee jumper? How about the carnival games? How many will you play? Many parks provide an automated teller machine so that you can indulge every extra to your heart's content. Study the park you'll be visiting and budget for how many extras you can afford. Don't fool yourself. These expenses add up quickly and can cause you budget problems when your day is done. This picture shows Hurricane Harbor, a popular water park attraction at Six Flags St. Louis. On this day, the parking lot is empty, the water is not flowing and no one is sliding. Chances are the crowds that arrived on this April opening day were well aware Hurricane Harbor was closed. But there are less obvious closures that can cause disappointments. Sometimes, a favorite ride is down for maintenance. If you're counting on a certain attraction, it doesn't hurt to send an email to guest relations asking if the ride will be functioning on the day of your visit. In the case of inclement weather, Six Flags could close some rides but the pledge is they will open them as soon as the weather clears. Remember that a refund is unlikely in these situations. Keep that firmly in mind if the weather forecast is threatening on the day of your visit. There are all sorts of strategies for how to manage your valuable time once inside the park. Some people say it's best to arrive at the opening hour and hit all the popular rides immediately. To do this, you'll have to become familiar with an online map of the park. Find several popular rides that are fairly close to one another and target them as your first stops. The parks will have signs that give you a rough estimate of waiting times based on the length of the line. Many of the bigger rides have 30-minute and 60-minute signs. Think long and hard about spending an hour in line for one attraction. Sometimes it can't be helped, but it will certainly limit what you're able to do with the rest of your day. Even on vacation, time is money. If you'll be visiting Six Flags during peak summer periods, you might want to consider a Flash Pass when you buy tickets. Understand that they represent a significant investment at some parks, and prices vary widely. Each pass comes with a list of attractions at which it is valid. The Flash Pass at Six Flags Great America near Chicago works for 19 rides across the park. Now for the bad news: the cost starts at $55 for a regular pass, and increases to $100 for a Gold Pass and $155 for a Platinum Pass. Since these prices are in addition to the entry fee, you'll need to place a value on your time during the visit. In contrast, a Flash Pass for Six Flags St. Louis is good for 14 attractions, but look at the price difference: the pass is $23-$60 per person, significantly cheaper than what you'll pay in the Chicago area. What do those various levels allow? A "regular" Flash Pass allows you to check in at a specified time and then come back later without standing in line. For example, if the estimated wait time is 60 minutes, you would simply come back in 60 minutes and get on the ride immediately. The next step up is a Gold Pass, which works much the same way and cuts that wait time significantly. At the top level, the Platinum Pass allows for wait time reductions of 90 percent, and you can ride again immediately after you finish getting back into line. Flash Passes are sold only for a single date on the calendar. Take a look at all the cars in this picture. The current rate for one of these parking spaces is $25. For those who plan multiple visits in the same season, a season parking pass costs $75. As with the Flash Pass example, parking rates vary by park. Preferred parking near the front can double the rate, but for those with small children it might be worth the investment, especially at the end of the day when the kids are exhausted. Season parking passes can be purchased with admission passes. There are extra charges for larger vehicles such as RVs. Six Flags offers a one-day dining deal that includes lunch, dinner and an afternoon snack for about $35-$40/person. That's not exactly dirt cheap, and many opt to eat a picnic lunch in the parking lot or simply eat off the property before arrival or after departure. If that's not a practical solution, there are prepaid meals available at a so-called discount. These rather ordinary meals (chicken strips, a slice of pizza, or a cheeseburger) can cost $15 at some parks, beverage included. Not much of a deal, but as always, you're paying for the convenience and time savings. The parks also offer individual deals after certain hours. I once saw a sign at the St. Louis park advertising a dinner for $6 after 6 p.m. The offer was limited and early in the season, so don't expect that price on your visit. But it pays to be on the alert for these offers. With all the walking and standing in the summer heat, you will get thirsty. Worse, you could become dehydrated. It's crucial that you stay hydrated during your day at Six Flags. But budget travelers often grimace when they see the cost of soft drinks or bottled water. Six Flags has a Season Drink Bottles it sells for about $25. With this deal, you get free refills for an entire season of visits, and the bottle can be used on the same terms at any Six Flags park. Some visitors combine the drink deal with prepaid meals and get a lower price. Six Flags parks once sold daily beverage passes good for unlimited refills the day of a visit. These appear to have given way to the season drink passes, which are offered at higher prices. Considering that outside drinks are not allowed in the parks, the daily passes used to make sense. If you can't find them at your park, the season beverage pass is a bit too expensive for visitors planning a one-day visit. If you plan frequent visits, a Six Flags season pass makes a lot of sense. The cost varies by property, but you are likely to see signs advertising them everywhere you go in the park. Starting with the third visit in a season, the pass usually pays for itself. There are a host of smaller perks you'll receive that vary by park. For example, you receive a "value book" with coupons for food, games and other park products; free admissions for friends; and free water park admissions where available. Look at the season schedule of events and your available off time. A Gold Season Pass increases the perks and comes at a much higher price. Weigh the values of the added benefits before upgrading. Many times, it's not worth the added cost. Never consider a season pass unless you're certain you'll be visiting several times in the course of a year. 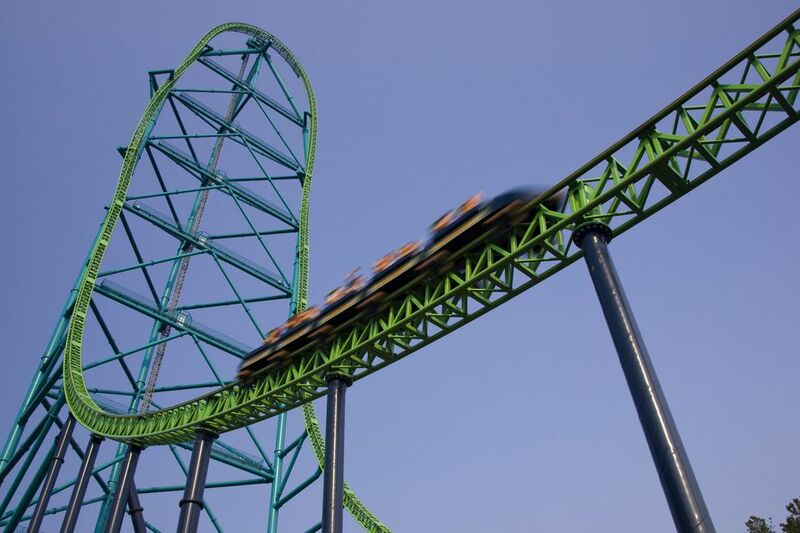 Is your church youth group heading to Six Flags? How about a family reunion activity at one of the parks? These are examples of situations where a group rate could save a lot of money over individual tickets. If your school or church group has at least 15 members, you'll pay significantly less for admission (and there's a discount for booking prior to May each year). Six Flags will also set up buffet meals at reduced prices. Because these prices vary by park and change throughout the season, it's smart to check the website of your destination park to see what's available. Book online to save time and money.